This show looks like it was really cool. It’s basically American Inventor without the overt competition. INVENTIONS ARE the stars of one of the most popular television shows in Britain. 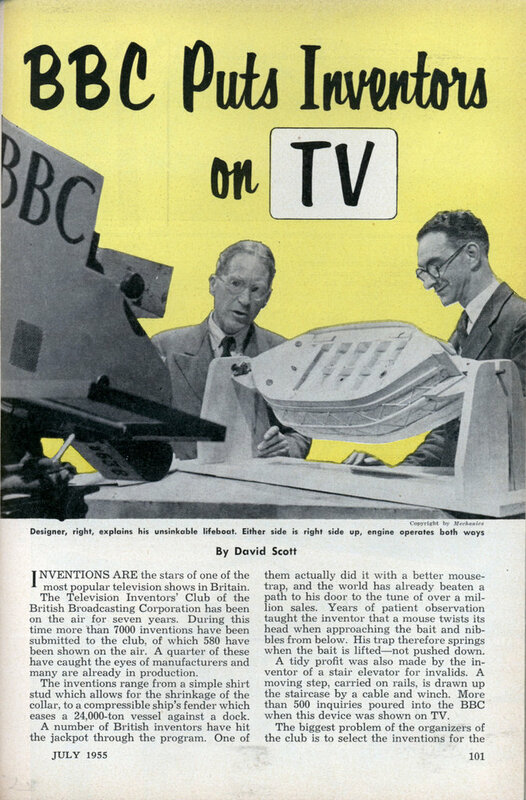 The Television Inventors’ Club of the British Broadcasting Corporation has been on the air for seven years. During this time more than 7000 inventions have been submitted to the club, of which 580 have been shown on the air. A quarter of these have caught the eyes of manufacturers and many are already in production. The inventions range from a simple shirt stud which allows for the shrinkage of the collar, to a compressible ship’s fender which eases a 24,000-ton vessel against a dock. A number of British inventors have hit the jackpot through the program. One of them actually did it with a better mousetrap, and the world has already beaten a path to his door to the tune of over a million sales. Years of patient observation taught the inventor that a mouse twists its head when approaching the bait and nibbles from below. His trap therefore springs when the bait is liftedâ€”not pushed down. A tidy profit was also made by the inventor of a stair elevator for invalids. A moving step, carried on rails, is drawn up the staircase by a cable and winch. More than 500 inquiries poured into the BBC when this device was shown on TV. The biggest problem of the organizers of the club is to select the inventions for the monthly program. Each broadcast reaps an average harvest of 200 new applications, most of which come in immediately after the show. Of these, about 40 percent are rejected outright because they are repetitious of previous contributions, obviously lack commercial prospects or are simply unsuited for television viewing. The surviving 60 percent are submitted to technicians in various fields. A panel of specialists from industry and business is maintained. The inventions may also be shown to technical journalists who are likely to know of the existence of similar inventions. To be approved, the idea must be patentable. A clever idea sometimes is turned down when it is apparent that any handyman could knock together the invention in half an hour at home. Usually about 60 inventions manage to survive these hurdles each week. They are subject to further examination which weeds out about half of them. The finalists, numbering perhaps 30, are then invited to the studio for a preview. Here the inventors demonstrate their ideas before the panel. When the last ax has fallen, 12 or 15 of them are left to appear on the next program. Some of the inventions that fall by the wayside, of course, are screwball ideas. One budding inventor offered to demonstrate his one and only cure for fog dispersal, but this miracle was never submitted. No more was heard, either, from an inventor who claimed to have developed a chemical substitute for a parachute! 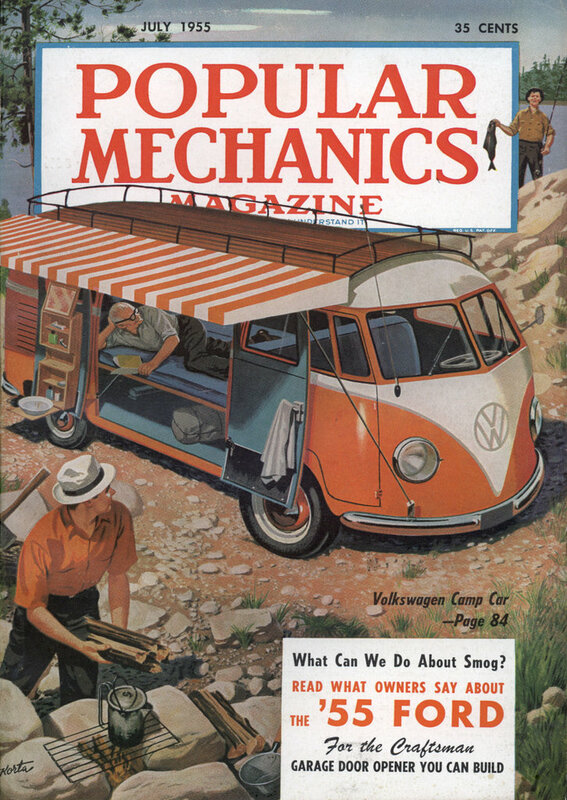 Another creative genius didn’t get very far with his “door engine,” which was supposed to convert the power used in opening and closing doors into useful energy. In the same class were roller skates especially designed to roll uphill. Emphasis is on ideas with clear commercial possibilities. Sometimes an idea appears worthwhile but obviously won’t pay off. No one, it was felt, would pay cash for gloves with a transparent watch panel in one wrist, or hand lights for cyclists to indicate turns at night. One of the biggest successes on the program was a cigarette economizer which made an ordinary smoke last 35 minutes. It consisted of a slotted tube around the cigarette which retarded combustion between puffs. Another success was an automatic dance instructor. Students stood on a raised glass panel and placed their feet on colored footprints cast on the glass by lights from below. The footprints varied in color and speed according to the dance step, and flashing arrows warned where the next would appear. The entertainment value of the show is not neglected. Once a bull was brought into the studio to show the use of an animal gag which pried the creature’s mouth open to permit easy dosing with medicine. Despite the severe misgivings of BBC officials for the safety of costly TV equipment, the act proceeded calmly for a time. But the beast grew restless when approached by the nervous inventor, who never before had been so close to a bull.